Government for the People in China? Surveys belie claims that Chinese are becoming fed up with their government. An apparent contradiction exists at the heart of political commentary on China. On the one hand, some foreign China watchers frequently discuss how ordinary Chinese citizens are growing increasingly dissatisfied with their government and communist party rule. On the other hand, public opinion polls have shown a high level of popular support for the ruling Chinese Communist Party. Indeed, in a major national face-to-face survey we participated in, the results of which we published recently in an article in Political Research Quarterly, we uncovered an extremely high level of public satisfaction with the national government. Based on responses from a national random sample of 3,763 Chinese, we found the average person’s support for the government in Beijing was about 8.0 on a 10-point scale. This result is consistent with calculations from other recent surveys. For example, according to the 6th Wave World Values Survey, conducted at the end of 2012 and the beginning of 2013, the average level of support among Chinese respondents was 7.5 on a 0-10 scale. This level of support compares favorably with many democratically elected governments across the world. From these numbers, then, the Chinese government hardly appears on the verge of collapse, as some commentators would have it. Instead, our research shows that, with respect to the political psychology of the Chinese people, political trust – a belief in the legitimacy of the government – appears as the dominant reason for their broad support of the political system. A number of theories have been advanced to explain the Chinese people’s high level of public trust in government. One often stated argument is that public opinion polls in China are simply not accurate. According to this view, in a repressive society like China, people are too afraid to tell researchers what they really believe, and instead feign support for the government. 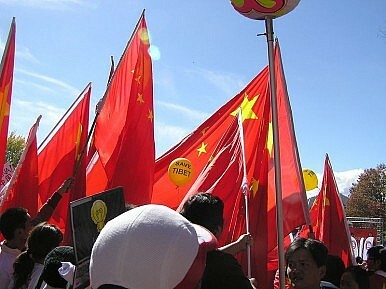 But this argument is belied by the lively online political discussion in China, the frequent protests and petitions, and even everyday conversations with ordinary people on the street, all of which make clear that individual citizens are not bashful about expressing their dissatisfaction with the state, even if they may be more cautious about participating in organized political activities. These observations also go against another common explanation for China’s high political trust – media censorship. This viewpoint contends that because the government inhibits the free flow of information in Chinese society, only positive news gets aired. As such, the media serves to mobilize public support of the government. However, controlling the internet is much more difficult in the information age. It is no longer easy to hide the dark side of government. The role of the media in political mobilization, we believe, has decreased. Profit considerations have further reduced the media’s role in political mobilization. In a market environment, media organizations compete for audience with different political opinions, resulting in media diversification. Also, there are social media sites which increasingly expose government corruption and scandals. Overall, then, claiming that most Chinese are only privy to “good news” about the government is hardly an accurate description of modern China. Economic performance is another frequently mentioned reason for the Chinese government’s popularity. This view holds that China’s high growth rates and improved living standards have left most Chinese happy with their personal finances and optimistic about their country’s future economic outlook. Because they attribute these economic conditions to government policy, they are by and large satisfied with the government’s performance. One problem with this economic explanation is that it fails to account for the gap between China and other high growth societies. At similar high levels of economic growth, why is political trust still higher in China than in other societies, such as India and Brazil? Mongolia, for instance, has had one of the highest growth rates in the world over the last few years and yet, in a June 2012 survey, “over 80 percent of respondents believed that government policies were ‘always’ or ‘often’ failing to solve their concerns.” Moreover, many democratic transitions in the Asia-Pacific, such as South Korea and Taiwan, began after the governments had begun improving the economy. Thus, it is hardly the case that economic growth automatically translates into high levels of support for the government.